One of my favorite gift ideas for this time of year is fingerless mittens. I am knitting a pair of Fetching fingerless mitts in our Mountain Colors 4/8's Wool for a holiday exchange with my Fiber (knit, spin, weave, etc) Guild. In past years I have knit at least 15 pairs of these for friends, family, gift exchanges, etc. They are always well received and don't take very long to make! I've used 4/8's, Twizzle and Mountain Goat...they all work great. 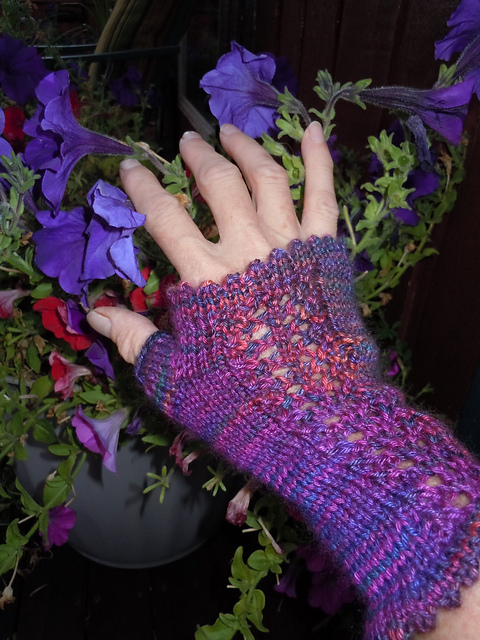 Another easy pattern is the Lacey Jeannette Wristers. They are knit with our Jeannette yarn (65% Cashmere/35% Silk). Talk about a super soft pair of mitts....YUM. Another fun possibility is the Sailor's Rib Fingerless Mitts. I knit these in Mountain Colors Twizzle. Note how the strand of silk in this yarn creates a wonderfully tweedy effect!! It is not to late to knit several pairs of fingerless mitts for your holiday gift list!! I'm off to work on mine.